Everyone loves leopard print, right? RIGHT! All you guys really seemed to enjoy the neon leopard manicure that I posted on Sunday. I even had a few requests for a leopard tutorial. For those of you that requested, your wish is about to come true! Leopard prints are easy and striking, and I wanted to show you guys a video demo of how I do mine. Once I had decided to do a blue themed variation on the leopard print, I started calling it a "denim leopard" in my head. It kinda stuck so I'm going with it! As you probably heard in the video (I type bideo every time), this manicure was made using all China Glaze polishes. The base is Agent Lavender, which, despite supposedly being lavender, looks blue in this manicure -- even in person (I think it is the fact that it is up next to the dark blue). The center of the spots are Secret Peri-winkle, and the outside of the spots are First Mate. The leopard print pattern is really versatile, in that you can do it in any combination of colors. Natural or psychedelic, leopard looks good under any circumstances. 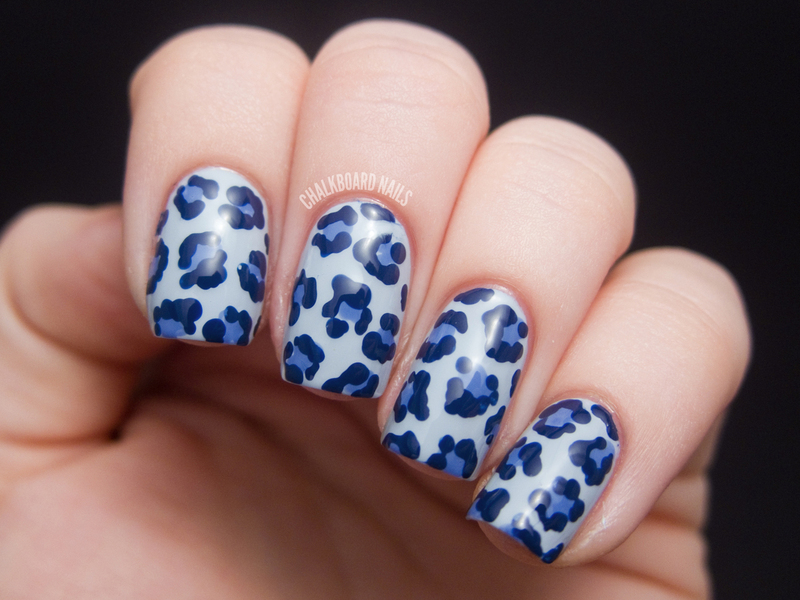 I hope this video tutorial has encouraged some of you to give the leopard print manicure a try! With a little bit of practice and some patience, you will soon be a master of fierceness! 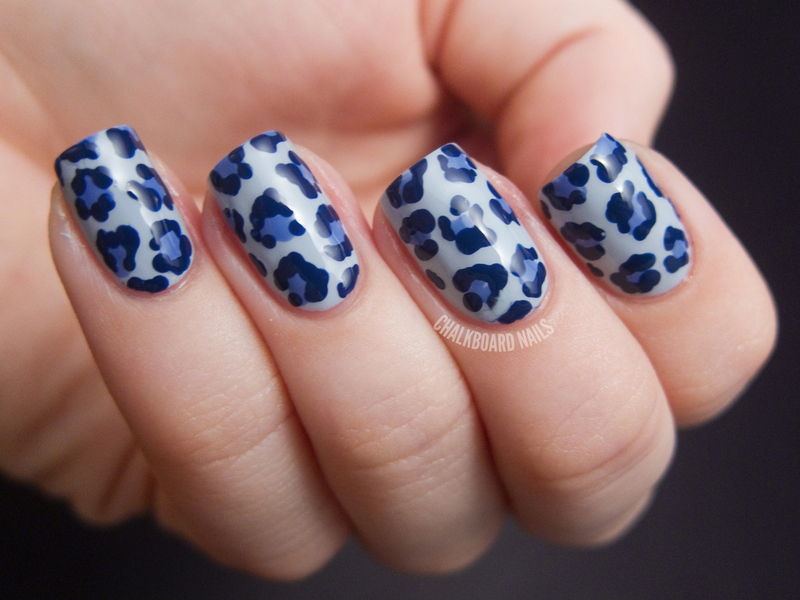 This looks amazing, I always love your leopard print! great tutorial! i love the blue theme! Great mani AGAIN and really good tutorial :) love it! EEPS!! I Love this! So many much!! I love this look too, I never tire of lepord print (in any colour) Great job! I love these colours for a leopard print!! 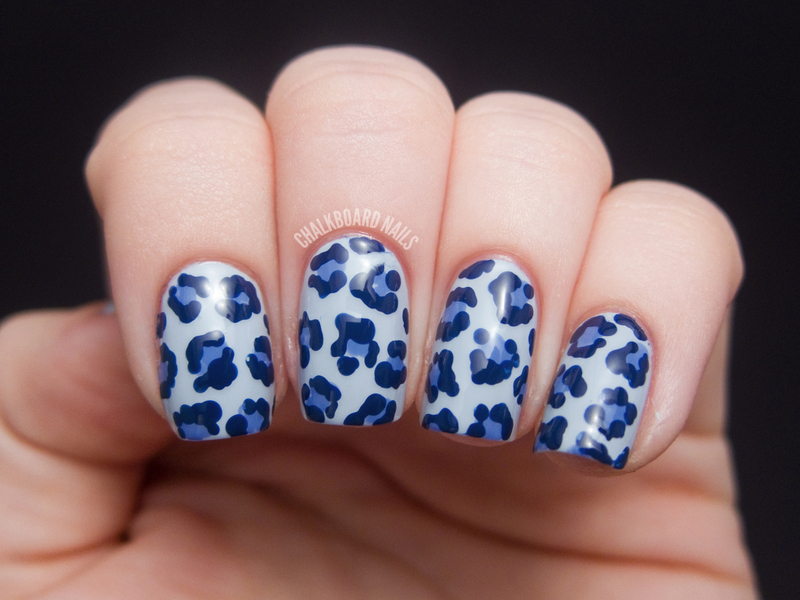 Wow I looove your denim leopard mani. Another great mani! I love this. So pretty! The video is awesome too!! Oh cool, I haven't tried leopard print yet, thanks for the tutorial! Good work! LOVE the tutorial! More of those please! You make it look so easy, you know I have to try it now! I cant get over how easy you make this look! Love the name and I love the look! Lovely manicure, have to try this once myself! LOVE leopard print!! Need to get some dotting tools(or bobby pins) so I can try this out! Thanks for sharing! This really helped! Thanks so much and your nails look amazing as always! using the make up brush to remove excess polish is a revelation! no wonder your nails look so neat! thats too cool. 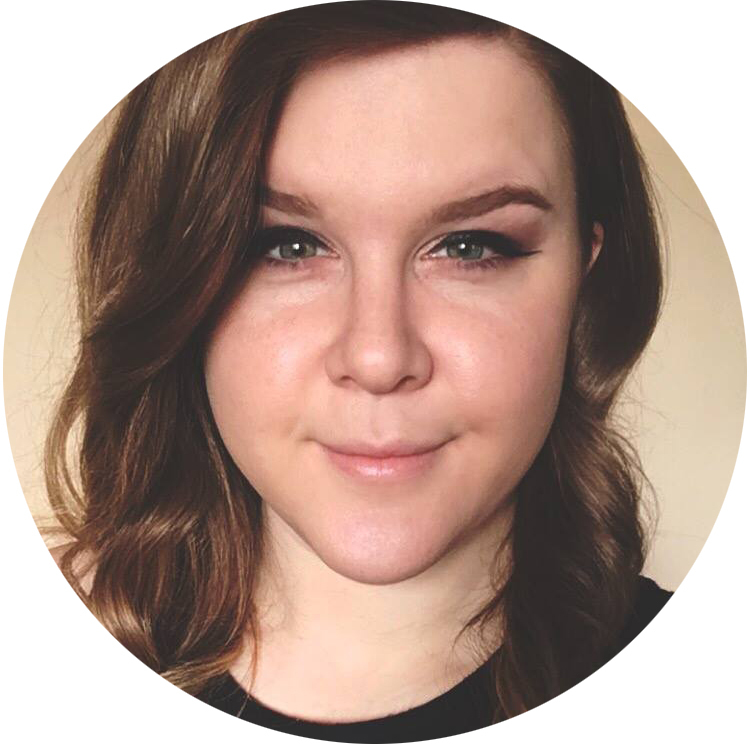 And any advice for improvement would be great (it's only my second ever blog post!). Thank you! lovely colours, i'll have to have a go at this! Sometimes it just takes practice to develop a steadier hand. You can try resting your pinky on the table to provide a more stable position from which to draw. Whats that thingy your using and where can I get one?!?! It's called a dotting tool. They sell them on eBay, Amazon, bornprettystore.com, and many beauty supply stores! Oh thanks, cause I've seen a lot of people use them, but I didn't know what it was. hey! i don't want to link drop, but i followed your tutorial to create my first ever leopard print mani! you can see them here: http://hex-beauty.blogspot.co.uk/2013/06/leopard-print-nail-art-with-gems.html thanks for a great tutorial, i am really proud of these nails and i have you to thank! You should be proud, they look great! Thank you for taking the time to comment! Please avoid link dropping and spamming. I reserve the right to remove any comments that I feel violate this policy. © Chalkboard Nails | Nail Art Blog | All rights reserved.